This is a perfect gift for the fisherman that has everything. 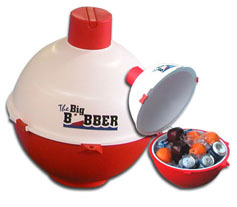 The Big Bobber looks like a gigantic size fishing bobber, but is actually a floating cooler! With ice it can hold 12 cans of “pop”. Just fill it up with ice and your favourite beverage then tie it to your canoe and off you go! You could use this just about anytime you are in or by the water just floating around. Bring it to the cottage and tie it to the dock, there’s no need to get out of the water or run back to the cottage for a drink. Planning a day of floating down the lazy river? The Big Bobber would be great to float along with you full of water so you don’t get dehydrated. Maybe you are planning on a portage. Although it wouldn’t be great carrying across land it sure would come in handy having a cold beverage paddling across those big lakes and it doesn’t take up any room in the canoe! Simply a fantastic idea and I would love to get one for my upcoming birthday!